NOTE: Elizabeth Johnson has chosen a descriptive subtitle for each section of her chapters. (You will also find these subtitles in the table of contents.) In the brief chapter summaries posted here, each subtitle introduces the main themes of the section. (1) From the beginning: History shows that human beings are naturally religious; that is, the record shows that humans have always sought (and are still seeking) the transcendent dimension of life. (2) Peoples of the Book: Jews, Christians and Muslims have shown, through their history and sacred texts, that their people have always sought to experience the Holy. The scriptures of all three traditions also describe a God who continually seeks for them. (3) Why the search? The living God is beyond description, and thus can never be wholly captured in words, but the human search for God goes on because the human heart is insatiable – and constant change in human culture mean that our experiences of God are always mediated through new realities. Thus new attempts to articulate ideas about God are to be expected. Christianity is now living through a new chapter in this quest. (4) Modern theism: Western culture has inherited an inadequate idea of God; this makes it difficult for us to understand God’s transcendence (always beyond us) and God’s immanence (always with us). New theologies are trying to expand our understanding of God, and of God’s relationship to the world. (5) Ground rules for the journey: There are three guidelines for this theological journey: first, God is always a mystery beyond telling; second, no expression for God can be taken literally; and third, God has many names. (6) High stakes: Ideas of God can become obsolete. As the future continuously arrives, only a living God, who spans all times and all cultures, can relate to new circumstances. As you search for the words to describe your own experiences of God, can you take heart from Elizabeth Johnson’s ‘ground rules for the journey’? That is, even for theologians, bishops, and clergy, God is always a mystery beyond telling; no expression for God can be taken literally; and God has many names? 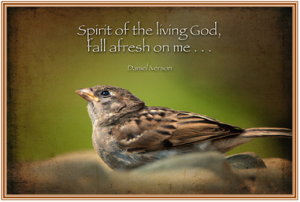 This entry was posted in Quest for the Living God by donna. Bookmark the permalink.